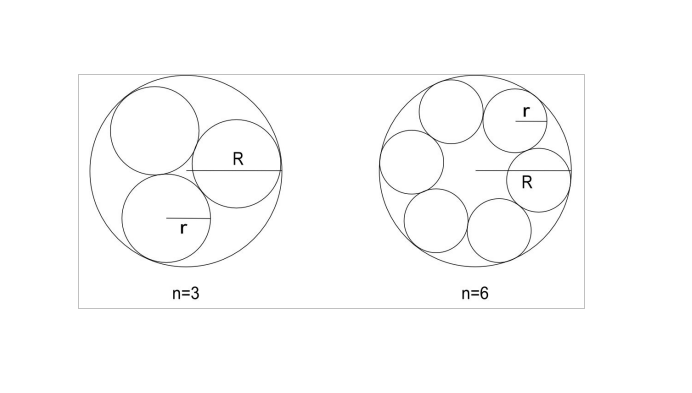 Consider a circle C of radius R. n smaller circles of same radius are to be placed inside C in such a way that each of the n smaller circles internally touches C and externally touches two other smaller circles. Given R and a positive integer n (n > 2), you have to find the radius r of the smaller circles. See the above figure for better understanding. The first line of the input gives the number of test cases, T (1 <= T <= 20). Each of following T lines will consist of two space separated integers R (1 <= R <= 1000) and n (3 <= n <= 100), representing the radius of the large circle and the number of circles to be inscribed in. For each test case print a single line containing the radius of the small circles. Print exactly two places after the decimal point. For clarification see the sample.